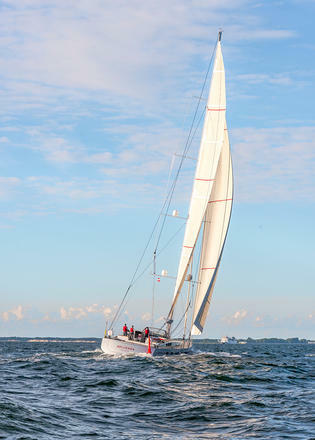 The 28 metre custom sailing yacht Bellkara has been delivered to her new owner by Conrad Shipyard, it has been confirmed. Launched earlier this summer with naval architecture and exterior design by Vincent Lebailly, Bellkara was handed over to her owner, who sailed her from Gdansk to the Cannes Yachting Festival for her public debut earlier this month. 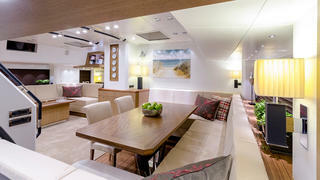 Twin helm stations sit behind the main deck saloon, where Bellkara is fitted out with two facing C-shaped sofas. From here a central set of stairs leads down to the open-plan saloon, which branches off to all three guest cabins and the galley. Accommodation is for seven guests, split across a master suite in the bow and two double cabins, as well as a pullman berth. 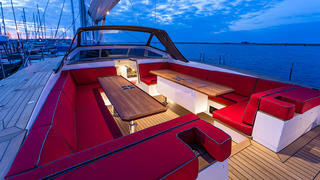 The crew quarters on this sailing sloop allow for a staff of up to four. In keeping with one of the key design trends spotted at Cannes Yachting Festival 2016, Bellkara has a notably bright interior for a sailing yacht thanks to the extensive superstructure glazing. The Conrad Shipyard in-house design team created a fresh, modern décor with bright red accents to match her topside stripe. A separate hatch aft provides discreet access to the crew cabins and engine room, while the transom tender garage houses Bellkara’s five metre jet tender, which can be launched via a two-wing hydraulic hatch in the deck. 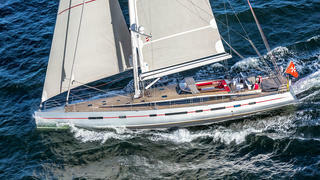 Built from an aluminium hull and superstructure, carbon mast and a hydraulic lifting keel, Bellkara displaces 83 tonnes. Auxiliary power comes from a single 355hp Cummins QSB5.9 engine for a cruising speed of 10 knots. Other projects currently under construction at the Polish yard include the 40 metre Conrad C133, which is due to launch next year.